"A whole orange is ground up and added to this cake along with raisins and walnuts. A delightful fruit filled cake!" Preheat oven to 350 degrees F (175 degrees C). Grease and flour a 9x13 inch pan. Squeeze orange and reserve 1/3 cup juice. Grind orange peel and pulp, raisins, and 1/3 cup walnuts together. Set aside. In a large bowl, blend flour, 1 cup sugar, baking soda, salt, milk, shortening and eggs. Beat 3 minutes at medium speed. Stir in orange-raisin mixture. Pour into prepared pan. Bake in the preheated oven for 35 to 40 minutes, or until a toothpick inserted into the center of the cake comes out clean. 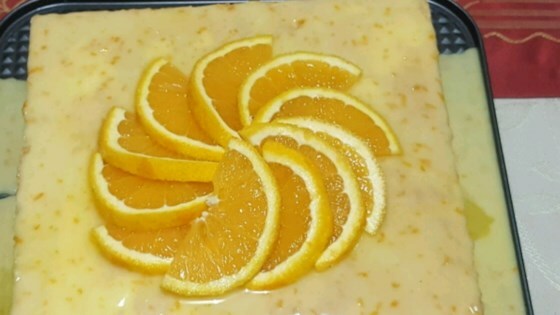 Drizzle reserved orange juice over warm cake. Combine 1/3 cup sugar, cinnamon, and 1/4 cup walnuts; sprinkle over cake. Garnish with orange slices. This is a yummy cake. I processed the walnuts and orange together. I also used currents instead of raisins, and left them whole. A nice light cake. Thiscake was one of my mother's favite to make and it brings back pleasant memories for me. This is a great cake full of lots of flavor, with the added benefit that my family of small kids believe that they have to kiss me to get a piece of cake! Thanks for posting it. WOW,Me and my family LOVED it!My oldest daughter (13) asked me If I could make it everyday for the rest of her life....LOL! Thank you for sharing this recipe!